To keep things even with her sister M decided she needed a new bag too. She also picked out her own fabric, which I think is very sophisticated for an 8 year old. I picked the pink on the inside. Pink used to be her favorite color, and matched well, so it got my vote. On this bag I did get to make some of the changes I'd thought of after making C's bag. This one is deeper, narrower, and ties at the top. 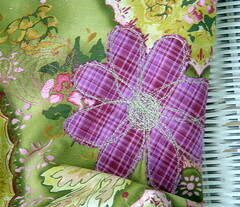 The flower is the same fabric as the lining, with a circly thing done next to it in bright pink. 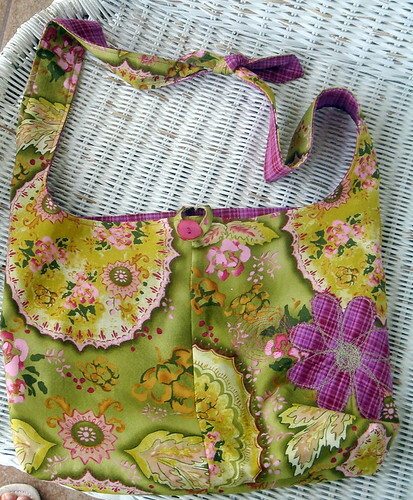 The bag is reversible, I didn't intend for it to be, but there's no reason it couldn't be. Here she is with her bag. It looks awfully big for her, but she wants to wear the strap across her chest and use it as a book bag. I absolutely love her fabric choice. It's completely different than anything I'd have expected her to pick, which is just such a reminder that she's growing up! Shameless plug ... I've posted a bunch of Classic Pooh auctions on eBay for Ditto Kiddo. Some of the stuff is really neat. Super cute...I love the tie at the top and the fact she wants to wear it sling wise! I love those kind of bags for school stuff. My old teaching bag was a messenger style too.